The first pumps ensured the supply of drinking water to people, thus increasing the quality of life. 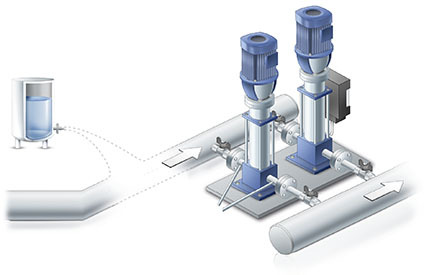 Today, pumps supply the widest range of media in many processes and designs. The safe monitoring and automatic control of output pressures and delivery volumes is important. Specially for these measuring tasks, WIKA offers the right portfolio for each application and each pump. Our pressure switches protect centrifugal pumps with insufficient input pressure against dry running. Pressure sensors measure the pressure at the output and allow a constant system pressure through energy-efficient speed control. They detect pressure rises when running against a closed valve or gate, thus protecting the pump. Diaphragm pumps are frequently used with aggressive or toxic media. Here, reliable diaphragm monitoring by pressure switches or process transmitters ensures the protection of people and the environment.